The compact TERGO® ULS offers performance, stability and reliability, meeting high demands and ensuring high productivity and low life cycle costs. Working for your medium intensive material handling operations with loads up to 1.400 kg. Its supreme manoeuvrability and narrow chassis (1120 mm width) further facilitate material handling in confined spaces. Designed to meet the highest standards, the focus is on the operators and the operation. Innovative ergonomics and safety technology ensure operator efficiency in a wide range of tasks. This nimble, silent and powerful reach truck also features a superior environment for the operator. Class leading ergonomics with UniCarriers unique mini steering wheel, intuitive controls and superior visibility by means of the innovative Pro Vision mast design aid to reduced operator strain and improved efficiency. 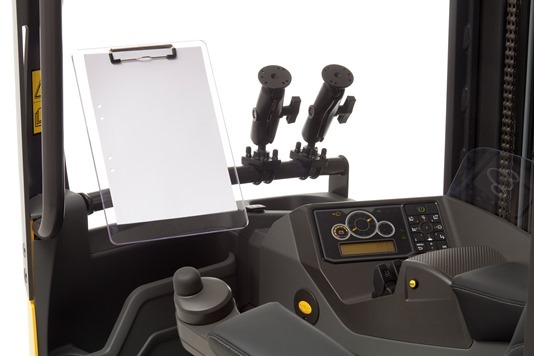 A wide range of optional equipment further increases operator productivity, such as ASR – Active Spin Reduction, S3 Stability Support System and Ergologic operator interface.